I discovered Indira and her lovely blog Mahanandi on IMBB. There, I read about her event “Jihva for Ingredients” and was struck by the poetic meaning of the word “Jihva”. In Sanskrit, Jihva means taste, desire and deep longing. The theme for Jihva for Ingredients #1 is mango – a fruit that I have always loved. Whether it’s mangoes from Mexico, Haiti, the Caribbean, South America or the Philippines, I deeply appreciate this fruit. I was surprised to learn, though, that there are over 1,000 varieties of mangoes in the world. When you are selecting mangoes, ripeness can be determined by smelling the end or by squeezing the fruit – it should be slightly soft to the touch. My first thought was to make mango pudding, which resembles a cross between a jelly and a pannacotta. Mango pudding is something that I always make room for when I go for dim sum. It is made in a variety of ways: sometimes with cream, sometimes with diced mango, and sometimes with agar-agar. The recipe that I made, mango coconut pudding with coconut sago, combines mango with coconut – two flavours that compliment each other perfectly. It is a dessert that counterbalances the creamy texture of mango pudding with the small pearls of tapioca in coconut milk. Note: Since mangoes are not always in season, I suggest using pre-made mango puree in desserts, as the puree has a more consistent taste and sweetness. Many bakeries, restaurants and hotels use puree because it is also cost effective. Mango puree is often sold in specialty and ethnic food stores. I have found mango puree at Loblaws/The Real Canadian Superstore, for all you Canadians. 1. Mix mango puree and sour cream together in a small bowl and set aside. 2. In a small bowl add gelatin and 2 Tbsp of water; let it sit for 5 minutes before using. 3. In a small pot, add heavy cream, whole milk, coconut milk and sugar and bring to a gentle boil. Add the gelatin to the cream mixture and stir until dissolved. 4. Let the mixture cool a bit; add the mango and sour cream mixture and then mix until fully combined. 5. Pour the mixture into glasses, cups or ramekins, and chill until set. 1. In a small pot or saucepan add whole milk and tapioca pearls. Bring the mixture to a boil, reduce heat to low and simmer for approximately 30 minutes. 2. Add sugar to the mixture and simmer for another 10 minutes. 3. Once the tapioca mixture is finished cooking, stir in coconut milk and simmer for 5 more minutes. 4. Let the mixture cool, then cover and refrigerate overnight. If the mixture is too thick, gradually add coconut milk or whole milk until you achieve the desired consistency. 5. 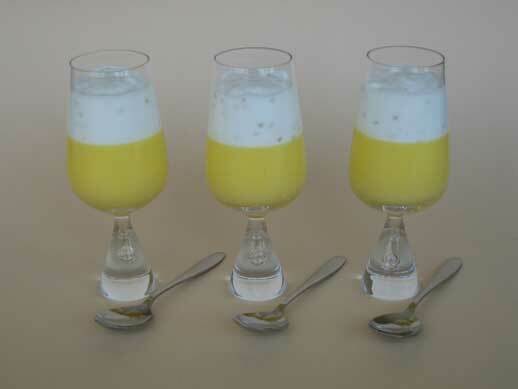 Spoon coconut sago onto mango coconut pudding and enjoy. Posted by Sam at 12:16 p.m. The combination looks wonderful and am sure it's a treat for tastebuds. Thanks for participating in this event with your colorful entry. As always your post is beautifully written and the dessert beautifully presented. I wasn't aware of this event so thank you for enlightening me. My brother adores mangoes so I may just have to make this one for him. A lovely and tropical treat, Sam. I want to pluck one of those puddings right out of the photo! You know, I don't think I've ever had coconut and mango together, which is ridiculous as I'm sure they'd go together quite wonderfully. Now I really want to try this! Mango and sago makes me feel like I am back in Asia - very lovely looking dessert! What a refreshing dish, I love it! Feel free to pluck any of my desserts, you are always welcome. Mango and coconut are fantastic together, I recommend it highly. Thanks. It is very Asian inspired isn't it. Btw.. I enjoyed your posts on Hong Kong. Thanks for your lovely comment. Thanks for visiting! Your blog looks fantastic. Mango is my favourite fruit! And the combination with coconut sounds delicious! Pity I didn't know about this event because I saw a lovely recipe with mango just a few days ago. Thanks Linda. You should make your mango dessert anyways! Cheers.